Innovators in any field are usually born from a lack of available options. For example, Disetronic was founded in Europe in 1984 by Willy and Peter Michel, two brothers who believed that diabetes care should be improved. These visionary men began with the goal of developing a small, top-quality insulin pump that would offer diabetics a better quality of life. Through the success of that groundbreaking innovation, Disetronic rapidly became one of the leading manufacturers of insulin pumps and infusion sets for diabetics, expanding from Switzerland into Germany, and, in 1991, entering the United States market for a global reach. In 2003, the Roche healthcare group acquired the infusion systems division of Disetronic. Roche has historically been one of the top manufacturers of glucose monitoring systems, so tapping into Disetronic's expertise in insulin delivery systems was a natural fit for the company. Today, the brand continues to develop safe, high-quality products that are easy to use for at-home diabetes management. 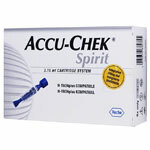 One of Disetronic's top sellers at ADW Diabetes is the Disetronic Accu-Chek Ultraflex II infusion set. This infusion set is designed to work with all standard luer lock insulin pumps, and it is so easy to use that no insertion device is needed. Connecting and disconnecting is easy - just one click and it is ready to go. We are pleased to carry a number of Disetronic infusion sets, including the Accu-Chek Rapid-D infusion set and the Accu-Chek Tender I infusion set. This trusted name also manufactures high quality supplies for insulin pumps. Refillable insulin cartridges, available in either glass or plastic, are both sterile and easy to fill making it easier than ever to manage your diabetes. Each cartridge holds 3mL of insulin. The D-TRONplus glass cartridges are available in a box of five, while the H-TRONplus plastic cartridges are packaged in a box of 25. Both types of cartridges are designed for use with insulin pumps designed by Disetronic such as the Accu-Check D-TRONplus and the H-TRON plus models. Many of this brand’s accessories for insulin pumps are available in our inventory as well. Pump adapters, such as the and the H-TRONplus adapters, prevent draining when you replace the insulin cartridge of your insulin pump. A built-in pressure valve on each adapter ensures a successful connection between the insulin pump and the infusion set - and helps keep the contents of the insulin cartridge sterile. In addition, their D-TRONplus Power Pack helps balance the air pressure in your insulin pump and creates a secure seal for optimal efficiency. With their ongoing commitment to quality and accuracy, we are honored to bring you a wide selection of options from this trusted name. We are committed to outstanding customer service coupled with access to the top brands at affordable brands. If you have any questions while shopping with us, please reach out for further assistance today. Our staff is always happy to help in any way.